Raw Strawberry Chocolates that stay set at room temperature (YES, you can store them in the pantry and take them places). Packed with superfoods and whole ingredients. Paleo, dairy-free, nut-free and sweetened with bee pollen. Find out exactly why they are so good for you and your loved ones. There’s a vegan option too! About a week ago I got this HUUUGE strawberry chocolate craving. After scouring the local shops and grocer’s for Lindt’s dark strawberry block, to no avail, I finally found time to give into the craving this week and made my own, raw version of the strawberry-flavoured chocolate. 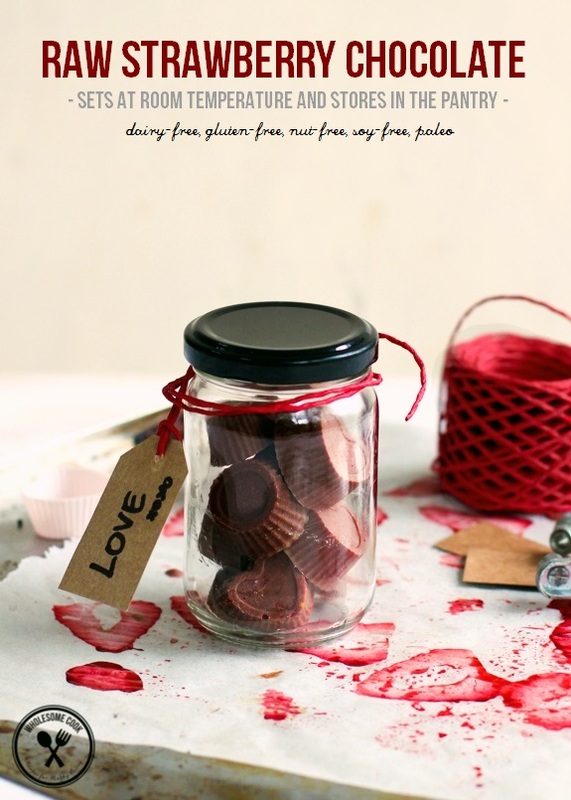 I first made raw chocolate using cacao butter (the more obvious choice than coconut oil which has a lower melting point) when I was working on a chocolate recipe for my Guilt-free Desserts eBook. 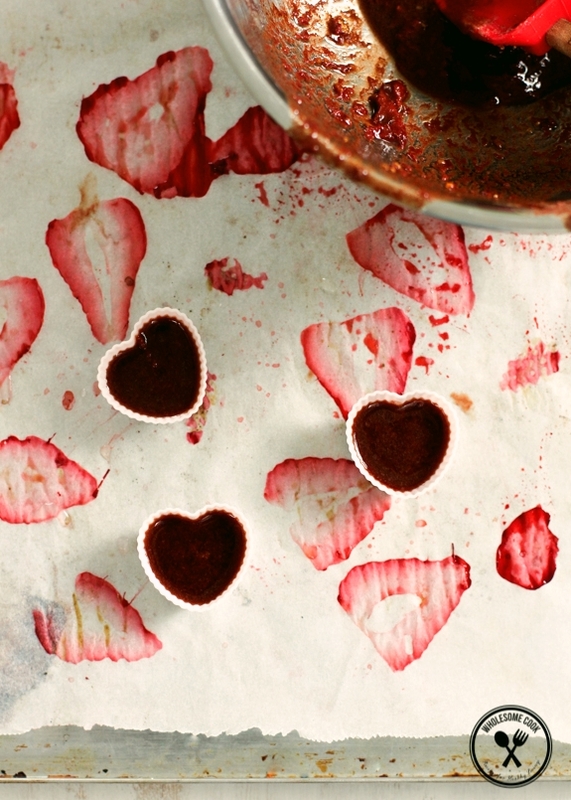 But now I thought… since I am at it, why not give it an extra super wholefood nutrient boost, add strawberries to satisfy my craving, set it in cute little heart-shaped moulds and share it with loved ones? 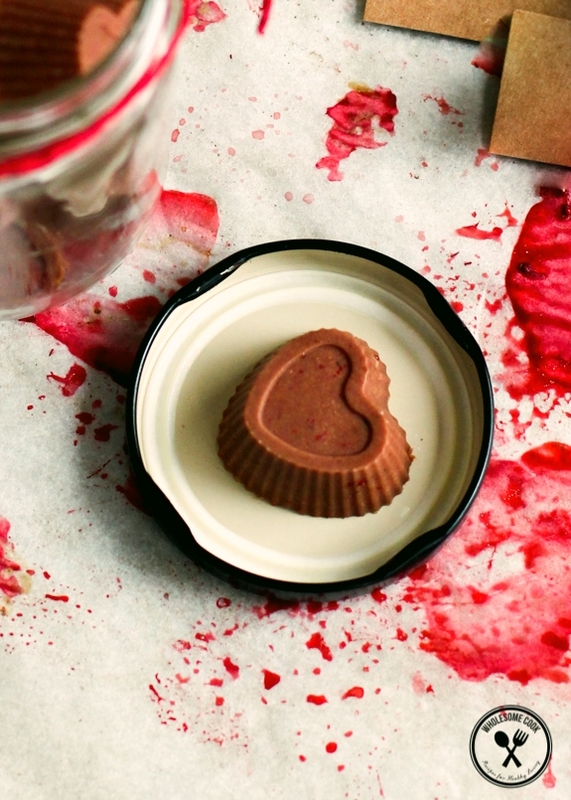 If you are into treating your favourite person in the world to something special on the 14th of Feb, then frankly, I think you should make a batch of these pronto. In fact, consumption of these Raw Strawberry Chocolates is highly encouraged often and for more reasons than one. In a nutshell? It’s this: 5 wholesome raw ingredients plus a pinch of sea salt. Nutrient-dense and allergy-friendly. Dairy-free, soy-free, gluten-free and nut-free because those are the most common allergy triggers. For a vegan version skip bee pollen and double the amount of maca powder instead. Raw Cacao is extracted from the cacao bean and processed using low temperatures to preserve its nutritional content. It contains vitamins C, magnesium, iron, chromium, manganese, zinc as well as the highest level of antioxidants of all foods. Raw cacao contains 40 times more antioxidants than blueberries)! Cocoa powder on the other hand has very little nutritional value left in comparison, due to a different processing method. Raw Cacao Butter, again, is extracted from the cacao bean and processed using low temperatures. It can be found at most health food stores – I like the Loving Earth brand. Raw cacao melts at approximately 38C (100F). For tempering, it should only be melted using a bowl over a hot water bath method and the melted liquid temperature should never rise above 48C (118F). The easiest way to achieve this is to bring a pan with a little water to a boil then turn off and remove from the heat source before placing a snug-fitting bowl with grated cacao butter over the top. Do not overmix the butter while melting. Unlike raw chocolate made with coconut oil which melts at room temperature (around 25C/77F), these chocolates will stay set at room temperature. That means they are portable and can be kept in the pantry. If you are expecting a heatwave over 35C (95F) then, just like you would with any old regular blocks, pop them in the fridge. Maca Powder comes from a South American cruciferous root plant and is rich in vitamins and minerals. It promotes endurance, stamina and, apparently, enhances sexual desire. It is also used to enhance mental acuity, physical vitality, oxygen in the blood, neurotransmitter production and increase fertility in men and women. It has a sweet, caramel-like flavour. Strawberries are high in fibre and vitamin C. They are a fantastic tonic for the skin, have anti-inflammatory properties and are relatively good source of folate, especially important for women trying to conceive. Bee Pollen is considered an energy and nutritive tonic in Chinese medicine. The percentage of rejuvenating elements in bee pollen exceeds those present in brewer’s yeast and wheat germ. It corrects the deficient or unbalanced nutrition. It has a surprising number of healing applications and is used for improving endurance and vitality, extending longevity, aiding recovery from chronic illness, adding weight during convalescence, reducing cravings and addictions, regulating the intestines, building new blood, preventing infectious diseases such as the cold and flu. Other things you could add include chia or other seeds, chopped nuts, organic shredded coconut, dried fruit, vanilla protein powder, raspberry jam or zest from an orange. These Raw Strawberry Chocolates are easy to make but there are a few things to note to help with the process. 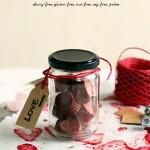 – The chocolates take about 20 minutes of actual work. There is some oven-drying time for the strawberries but you can skip that if you’re in a hurry or don’t want to heat the berries to 50C (122F). There’s also setting time for the chocolate, but if you don’t want to wait for the chocolate to set naturally, pop them in the fridge of freezer. – If you are working with a limited number of moulds and your chocolate hardens while you wait for the chocolates to set, you can easily melt it over and over again by placing the bowl back over a pan filled with boiled water. Do not overmix the chocolate, just let it melt. “chopping” the hardened chocolate with a metal spoon once or twice to speed up the process. Unlike raw chocolate made with coconut oil which melts at room temperature (around 25C/77F), these chocolates will stay set at room temperature. That means they are portable and can be kept in the pantry. If you are expecting a heatwave over 35C (95F) then, just like you would with any old regular blocks, pop them in the fridge. Raw cacao butter can be found in most health food stores - I use the Loving Earth brand. Other things you could add include chia or other seeds, chopped nuts, organic shredded coconut, dried fruit, vanilla protein powder, raspberry jam or zest from an orange. You can omit the dehydrating step for the strawberries if you like, but their flavour won't be as intense and the puree will be more watery. Set the oven to the lowest setting (I set mine to 50C/122F). Slice strawberries thinly and place on a baking sheet lined with baking paper. Dehydrate in the oven for 2 hours (you can dry pumpkin seeds, sunflower seeds or activated nuts at the same time). Puree - you should have about 2 tablespoons of puree. Shave cacao butter using a kitchen grater. Place in a dry stainless steel bowl that will fit snugly over the top of a saucepan. Bring a little water to the boil in the saucepan and remove from heat. Place the bowl with cacao butter over the top and allow it to melt, stirring gently a couple of times to distribute the heat. Do not heat above 48C (118F) - there is no risk of that if you take the saucepan off the boil. Add strawberry puree, bee pollen and sift in cacao and maca powders, add sea salt. Stir to combine. Reheat chocolate using these guidelines if needed during the process. Pour chocolate into moulds and allow to set at room temperature for around 2 hours or in the fridge for 20 minutes. Remove from moulds and store in an air-tight container in the pantry or fridge (in summer or on really hot days). Oh wow, here I was looking for valentines recipes on Pinterest and up pops yours! Yummo and look how good that is, though I don’t think we need any more feritiity boosting. Hahaha! Have a good weekend and thanks for this. You’ve done it again. I tried your cherry ripe bites the other day and they were so good! Now this. Love to see all the other good stuff added to these, especially the bee pollen as sweetener! So innovative. OMG! Once again. Loving the helathier chocolate series Martyna. Finally we can indulge in something that’s truly good for us. 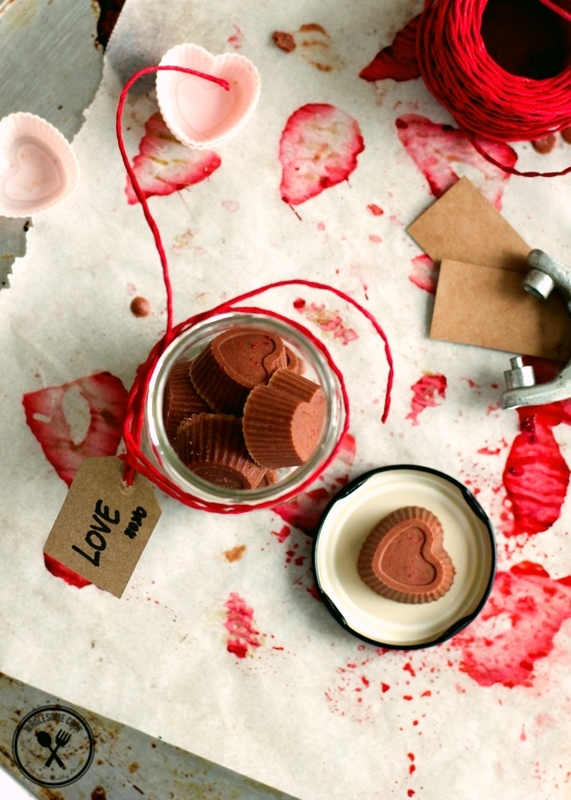 Chocolate that’s healthy and good for us – definitely a winner here! Strawberry chocolate is always a winner and one is never enough! Another great healthier dessert option Martyna. Love it! What is the purpose of the bee pollen and maca powder? Can you omit both or replace with another ingredient? Hi Zara, they are there are super nutrient dense boosters. Bee pollen is has healing properties and maca is rich in micronutrients. You can omit them altogether if you wish as they can be hard to come by. Hi there, this may have been mentioned elsewhere, but how do you get bee pollen? I have friends with bees, but I’m not sure what to do. Do you add anything else for sweetness other than the strawberries? Hi Deb, I don’t between the strawberry powder, bee pollen and maca they are what you could probably describe as 60-70% dark chocolate flavour. You could add a little milled unrefined sugar (such as unrefined Demerara or coconut), or a few drops liquid stevia. Hi there! I love your site! What kind of molds did you use please? This is so amazing!!!! Thanks Michelle, I used silicone chocolate moulds – available from most good kitchenware stores.